Nicolas Camille Flammarion FRAS (26 February 1842 – 3 June 1925) was a French astronomer and author. He was a prolific author of more than fifty titles, including popular science works about astronomy, several notable early science fiction novels, and works on psychical research and related topics. He also published the magazine L'Astronomie, starting in 1882. He maintained a private observatory at Juvisy-sur-Orge, France. Camille Flammarion was born in Montigny-le-Roi, Haute-Marne, France. He was the brother of Ernest Flammarion (1846–1936), founder of the Groupe Flammarion publishing house. He was a founder and the first president of the Société astronomique de France, which originally had its own independent journal, BSAF (Bulletin de la Société astronomique de France), first published in 1887. In January 1895, after 13 volumes of L'Astronomie and 8 of BSAF, the two merged, making L’Astronomie the Bulletin of the Societé. The 1895 volume of the combined journal was numbered 9, to preserve the BSAF volume numbering, but this had the consequence that volumes 9 to 13 of L'Astronomie can each refer to two different publications, five years apart from each other. 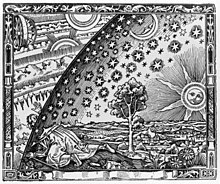 The "Flammarion engraving" first appeared in Flammarion's 1888 edition of L’Atmosphère. In 1907, he wrote that he believed that dwellers on Mars had tried to communicate with the Earth in the past. He also believed in 1907 that a seven-tailed comet was heading toward Earth. In 1910, for the appearance of Halley's Comet, he believed the gas from the comet's tail "would impregnate [the Earth’s] atmosphere and possibly snuff out all life on the planet." As a young man, Flammarion was exposed to two significant social movements in the western world: the thoughts and ideas of Darwin and Lamarck, and the rising popularity of spiritism with spiritualist churches and organizations appearing all over Europe. He has been described as an "astronomer, mystic and storyteller" who was "obsessed by life after death, and on other worlds, and [who] seemed to see no distinction between the two." He was influenced by Jean Reynaud (1806–1863) and his Terre et ciel (1854), which described a religious system based on the transmigration of souls believed to be reconcilable with both Christianity and pluralism. He was convinced that souls after the physical death pass from planet to planet, progressively improving at each new incarnation. In 1862 he published his first book, The Plurality of Inhabited Worlds, and was dismissed from his position at the Paris Observatory later the same year. It is not quite clear if these two incidents are related to each other. His psychical studies also influenced some of his science fiction, where he would write about his beliefs in a cosmic version of metempsychosis. In Lumen, a human character meets the soul of an alien, able to cross the universe faster than light, that has been reincarnated on many different worlds, each with their own gallery of organisms and their evolutionary history. Other than that, his writing about other worlds adhered fairly closely to then current ideas in evolutionary theory and astronomy. Among other things, he believed that all planets went through more or less the same stages of development, but at different rates depending on their sizes. The fusion of science, science fiction and the spiritual influenced other readers as well; "With great commercial success he blended scientific speculation with science fiction to propagate modern myths such as the notion that “superior” extraterrestrial species reside on numerous planets, and that the human soul evolves through cosmic reincarnation. Flammarion's influence was great, not just on the popular thought of his day, but also on later writers with similar interests and convictions." In the English translation of Lumen, Brian Stapleford argues that both Olaf Stapledon and William Hope Hodgson have likely been influenced by Flammarion. Arthur Conan Doyle's The Poison Belt, published 1913, also has a lot in common with Flammarion's worries that the tail of Halley's Comet would be poisonous for earth life. Camille was a brother of Ernest Flammarion and Berthe Martin-Flammarion, and uncle of a woman named Zelinda. His first wife was Sylvie Petiaux-Hugo Flammarion, and his second wife was Gabrielle Renaudot Flammarion, also a noted astronomer. Beginning with Giovanni Schiaparelli's 1877 observations, 19th century astronomers observing Mars believed they saw a network of lines on its surface, which were named "canals" by Schiaparelli. These turned out to be an optical illusion due to the limited observing instruments of the time, as revealed by better telescopes in the 1920s. Camille, a contemporary of Schiaparelli, extensively researched the so-called "canals" during the 1880s and 1890s. Like American astronomer Percival Lowell, he thought the "canals" were artificial in nature and most likely the "rectification of old rivers aimed at the general distribution of water to the surface of the continents." He assumed the planet was in an advanced stage of its habitability, and the canals were the product of an intelligent species attempting to survive on a dying world. Flammarion approached spiritism, psychical research and reincarnation from the viewpoint of the scientific method, writing, "It is by the scientific method alone that we may make progress in the search for truth. Religious belief must not take the place of impartial analysis. We must be constantly on our guard against illusions." He was very close to the French author Allan Kardec, who founded Spiritism. Flammarion had studied mediumship and wrote, "It is infinitely to be regretted that we cannot trust the loyalty of mediums. They almost always cheat". However, Flammarion, a believer in psychic phenomena, attended séances with Eusapia Palladino and claimed that some of her phenomena were genuine. He produced in his book alleged levitation photographs of a table and an impression of a face in putty. Joseph McCabe did not find the evidence convincing. He noted that the impressions of faces in putty were always of Palladino's face and could have easily been made, and she was not entirely clear from the table in the levitation photographs. His book The Unknown (1900) received a negative review from the psychologist Joseph Jastrow who wrote "the work's fundamental faults are a lack of critical judgment in the estimation of evidence, and of an appreciation of the nature of the logical conditions which the study of these problems presents." After two years investigation into automatic writing he wrote that the subconscious mind is the explanation and there is no evidence for the spirit hypothesis. Flammarion believed in the survival of the soul after death but wrote that mediumship had not been scientifically proven. Even though Flammarion believed in the survival of the soul after death he did not believe in the spirit hypothesis of Spiritism, instead he believed that Spiritist activities such as ectoplasm and levitations of objects could be explained by an unknown "psychic force" from the medium. He also believed that telepathy could explain some paranormal phenomena. In the 1920s Flammarion changed some of his beliefs on apparitions and hauntings but still claimed there was no evidence for the spirit hypothesis of mediumship in Spiritism. In his 1924 book Les maisons hantées (Haunted Houses) he came to the conclusion that in some rare cases hauntings are caused by departed souls whilst others are caused by the "remote action of the psychic force of a living person". The book was reviewed by the magician Harry Houdini who wrote it "fails to supply adequate proof of the veracity of the conglomeration of hearsay it contains; it must, therefore, be a collection of myths." In a presidential address to the Society for Psychical Research in October 1923 Flammarion summarized his views after 60 years into investigating paranormal phenomena. He wrote that he believed in telepathy, etheric doubles, the stone tape theory and "exceptionally and rarely the dead do manifest" in hauntings. He was also a member of the Theosophical Society. He was the first to suggest the names Triton and Amalthea for moons of Neptune and Jupiter, respectively, although these names were not officially adopted until many decades later. George Gamow cited Flammarion as having had a significant influence on his childhood interest in science. Asteroids: 1021 Flammario is named in his honour, and it is believed that 107 Camilla derives from Flammarion's first name. In addition, 154 Bertha commemorates his sister; 654 Zelinda his niece; and 87 Sylvia possibly his first wife. 141 Lumen is named after Flammarion's book Lumen: Récits de l'infini; 286 Iclea for the heroine of his novel Uranie; and 605 Juvisia after Juvisy-sur-Orge, France, where his observatory was located. In 1897, he received the Prix Jules Janssen, the highest award of the Société astronomique de France, the French astronomical society. He was made a Commandeur de la Legion d'honneur in 1922. La pluralité des mondes habités (The Plurality of Inhabited Worlds), 1862. Real and Imaginary Worlds, 1865. God in nature, 1866. Flammarion argues that the mind is independent of the brain. L'atmosphère: Des Grands Phenomenes, 1872. (Appears to be an earlier edition of L'atmosphère: météorologie populaire 1888 which does not have the Flammarion engraving). Récits de l'infini, 1872 (translated into English as Stories of Infinity in 1873). Astronomie populaire, 1880. His best-selling work, it was translated into English as Popular Astronomy in 1894. Les Étoiles et les Curiosités du Ciel, 1882. A supplement of the L'Astronomie Populaire works. An observer's handbook of its day. Uranie, 1889 (translated into English as Urania in 1890). La planète Mars et ses conditions d'habitabilité, 1892. La Fin du Monde (The End of the World), 1893 (translated into English as Omega: The Last Days of the World in 1894), is a science fiction novel about a comet colliding with the Earth, followed by several million years leading up to the gradual death of the planet, and has recently been brought back into print. It was adapted into a film in 1931 by Abel Gance. L’inconnu et les problèmes psychiques (published in English as: L’inconnu: The Unknown), 1900, a collection of psychic experiences. ^ "1926MNRAS..86R.178. Page 178". articles.adsabs.harvard.edu. Retrieved 2017-03-21. ^ "Martians Probably Superior to Us; Camille Flammarion Thinks Dwellers on Mars Tried to Communicate with the Earth Ages Ago". The New York Times. November 10, 1907. Retrieved 2009-11-14. Prof. Lowell’s theory that intelligent beings with constructive talents of a high order exist on the planet Mars has a warm supporter in M. Camille Flammarion, the well-known French astronomer, who was seen in his observatory at Juvisy, near Paris, by a New York Times correspondent. M. Flammarion had just returned from abroad, and was in the act of reading a letter from Prof. Lowell. ^ "Flammarion's Seven Tailed Comet". Nelson Evening Mail. 30 July 1907. Retrieved 2009-11-15. ^ James A. Herrick (2008). Scientific Mythologies: How Science and Science Fiction Forge New Religious Beliefs. InterVarsity Press. p. 56. ISBN 978-0-8308-2588-2. ^ Andre Heck (2012). Organizations and Strategies in Astronomy. Springer Science & Business Media. p. 193. ISBN 978-94-010-0049-9. ^ James A. Herrick (2008). Scientific Mythologies: How Science and Science Fiction Forge New Religious Beliefs. InterVarsity Press. p. 57. ISBN 978-0-8308-2588-2. ^ M. Dinorben Griffith and Madame Camille Flammarion, "A Wedding Tour in a Balloon" Strand Magazine (January 1899): 62–68. ^ Joseph McCabe. (1920). Is Spiritualism Based on Fraud? : The Evidence Given By Sir A. C. Doyle and Others Drastically Examined. London, Watts & Co. p. 57. "The impressions of faces which she got in wax or putty were always her face. I have seen many of them. The strong bones of her face impress deep. Her nose is relatively flattened by the pressure. The hair on the temples is plain. It is outrageous for scientific men to think that either "John King" or an abnormal power of the medium made a human face (in a few minutes) with bones and muscles and hair, and precisely the same bones and muscles and hair as those of Eusapia. I have seen dozens of photographs of her levitating a table. On not a single one are her person and dress entirely clear of the table." ^ Joseph Jastrow. (1900). The Unknown by Camille Flammarion. Science. New Series, Vol. 11, No. 285. pp. 945–947. ^ Harry Houdini. (1926). Haunted Houses by Camille Flammarion. Social Forces. Vol. 4, No. 4. pp. 850–853. ^ A. Merritt (2004). The Moon Pool. Wesleyan University Press. p. 31. ISBN 978-0-8195-6706-2. ^ Rabkin, Eric S. (2005). Mars: A Tour of the Human Imagination. Greenwood Publishing Group. p. 91. ISBN 978-0275987190. Wikimedia Commons has media related to Camille Flammarion.